Since, we believe in simplicity. Therefore, our developers have design this widget with splendid functionalities. It is an automatic Live Tweet widget that displays tweets of different users. 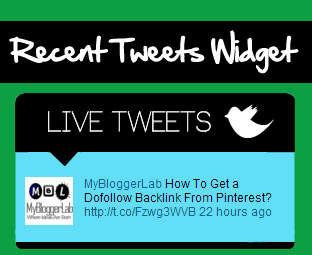 For Example, a person selects #mybloggerlab tag from the widget’s setting. Now whenever, any user will use (#mybloggerlab) tag in their tweets. This widget will automatically fetch and display them. Following is the screenshot of Recent Tweets Widget. It will display all the tweets that a person will receive from different users. This widget is interactive. Therefore, tweets will update instantly. It has a compact look which will surely increase the beauty of a website. It works perfectly on almost each and every browser i.e. Chrome, Internet explorer and etc. This widget is highly compressed. Thus, it not affects a person’s site Speed. The steps are put into words in such a way that both blogger and any ordinary person can easily integrate this widget in their website. Follow the following instruction. Go to Blogger >> Template. In The Template Search For ]]></b:skin> and above it paste the following Style sheet Code. Replace mybloggerlab with your twitter user name. Now Save the template and proceed to the next step. Go To Blogger >> Layout >> Add a Gadget. Now within the HTML Box paste the following Code. All Done: After pasting the above HTML Coding go ahead and save the template by pressing Save Bottom. Now visit your website and enjoy the unforgotten perfection. Hope you guys have adored today’s Tutorial. Since, the PageRank Update is near why not get a Dofollow Backlink from Pinterest. According to our estimates, Page Rank will be updated in between 10 November to 5 December. What are your thoughts about this widget? What is your expectation about the Page Rank Update? Don’t forget to leave your precious comment. Take a lot care of your families till then Peace, Blessings and happy tweeting. Nice One I was Looking For it. Of course, what a magnificent blog and informative posts, I will bookmark your site.Best Regards! Remove Background . Very Nice widget Syed bhai. keep up the good work. Good widget , But I really liked the related post widget which you are using on your blog ! Can you give a tutorial on that ! Please tell me how to remove/delete a label from posts in new blogger other than going to each post and removing. good tips. how to change the colour? It Displays All the Tweets That a Twitter Account Has Received from different twitter users.